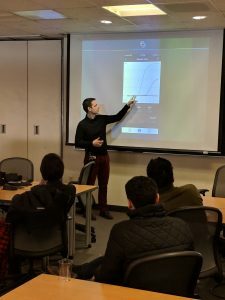 On Tuesday, March 13, 2018, Biomeme co-founder Max Perelman visited Thomas Jefferson University (or Jefferson University as it is affectionately known) to share the Biomeme platform with a group of researchers and medical professionals. The talk entitled “qPCR anywhere you need it – a tour of the Biomeme Platform” included a demo of Biomeme’s end-to-end platform, including the shelf-stable sample prep and test kits, the two3™ mobile PCR device, and web portal. In addition, Max gave the first public demonstration of the company’s next-generation device, the three9™. Founded in 1824 as Jefferson Medical College, Thomas Jefferson University is located in Philadelphia Pennsylvania. The university consists of six constituent colleges and schools: Sidney Kimmel Medical College, Jefferson College of Biomedical Sciences, Jefferson College of Health Professions, Jefferson College of Nursing, Jefferson College of Pharmacy, and Jefferson College of Population Health. Max explaining an example PCR curve generated by the Biomeme two3. 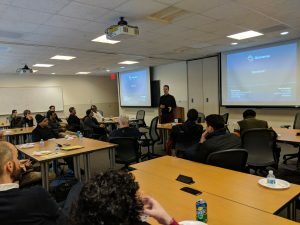 Biomeme’s offices are located very close to Jefferson University, so it was a real pleasure to share our story and to demonstrate the amazing Biomeme platform with our neighbors. We would like to say a special thank you to Megha Verma for inviting us to give this talk.